History has never been better dressed! Scroll down to view all our fabulous presentations, each lasting up to 1½ hours and featuring beautiful displays of original fashions and accessories. We explore a wide range of fascinating topics - fashion, history, politics, art and literature. Words can't quite describe... Come and see us in action! Click here for details on current fees and expenses. The Two Lucys take on the 1970s in this groovy new celebration of history's most orange-and-brown decade, with Bri-Nylon, Biba, bra-less Women's Libbers... Disco sparkle, psychedelia, Punk, ponchos, hot pants and platforms! A hilarious new history of bedtime. Covered-up cotton gowns, or brazen in Bri-Nylon - we explore boudoir glamour, bedtime stories, the science of sleep and the rise of the Duvet Day. What would you wear to war? The stirring stories behind Lucy Adlington's new costume history book Ready for Action - a unique insight into the experiences of women worldwide during World War Two and the aftermath. Art, glamour and intrigue! Explore the lure of gold in fashion and the hidden world of women in art. Inspired by the dazzling embellishments of artist Gustav Klimt... and the fate of one of his most famous paintings. Did you wear Laura Ashley? Prairie dresses and floral frocks... Indulge in fashion nostalgia with classic Laura Ashley clothes from the 1960s to now. Jane Austen's guide to being brazen. A bold, brash and beautiful celebration of Austen's wicked women, and a truly revelatory look at clothes & crime in the eighteenth century. 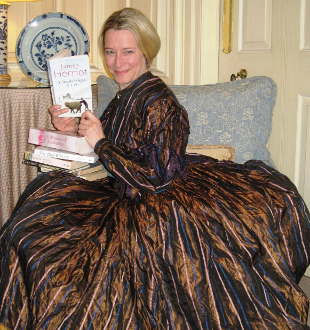 Do you remember the Liberty bodice? We transform a domestic drudge into a glamour goddess, with the help of bullet bras, sugared petticoats and sterling advice from the experts, all set in the decade that reinvented dazzle. All the dark drama of black in fashion, and the best of British supernatural stories. 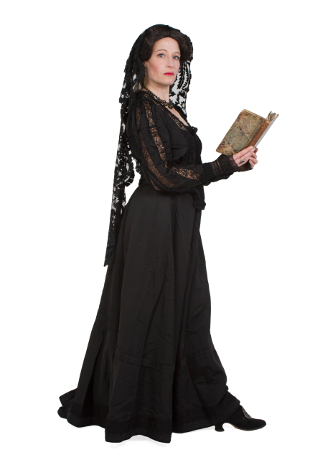 Shiveringly beautiful costumes and readings from Jane Austen, the Brontës and Mary Shelley. 1930s sophistication, swinging sixties, outrageous '80s... the two Lucys showcase sensational special occasion outfits, including ball gowns and work suits, first date frocks and frillies for the wedding night. A happy history of swimwear, from the bracing bathing of the 18th Century to knitted cozzies and kiss-me-quick hats. 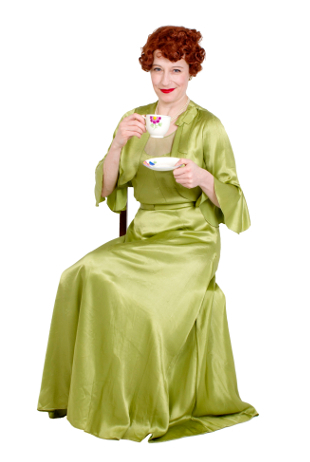 With fun stories and fabulous vintage costumes covering 200 years of seaside fashion. A terribly tempting talk set in the 1930s - a decade of streamlining, speed and style. 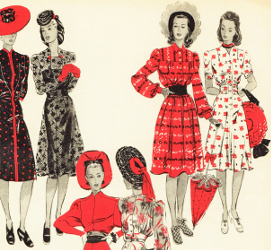 Find out what's on at the pictures, what's cooking in the kitchen, and how diet and drastic underwear can help you fit in the sleek lines of thirties frocks. Pink represents romance, intimacy, passion and power. Girl's colour? Boy's colour? The truth will be revealed in all its pink-tinted glory! Seductive, sensational and chic, this stunning fashion presentation celebrates the life ans times of the Queen of Crime, with dazzling Art Deco fashions and the added twist of a mystery to solve. 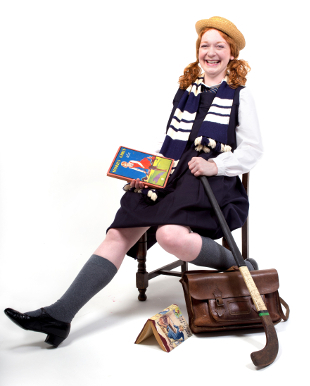 A simply smashing show about school days and school stories. 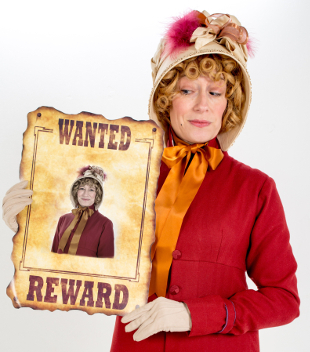 Discover the often-untold tales of pioneers in education for girls, and enjoy school uniform and gym kit galore! A truly enchanting presentation of magical clothes and well-loved tales, re-creating a dazzling 18th century silver silk gown for Cinderella to wear to the ball. 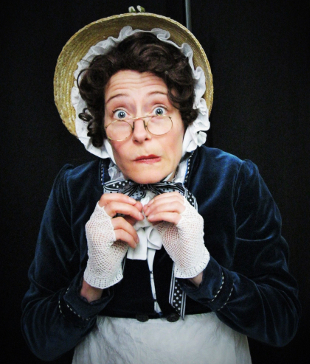 Spinster, matron, mother, widow... Jane Austen's novels may have delightful young heroines, but they are also rich with rather older characters who now have the spotlight in this unique presentation celebrating old maids and matriarchs, from Miss Bates to Lady Catherine de Bourgh. Fashions from the 1940s to the 1990s From the New Look to the New Romantics, Flower Power to power dressing. A brilliant 'do you remember?' experience with a fantastic music soundtrack. 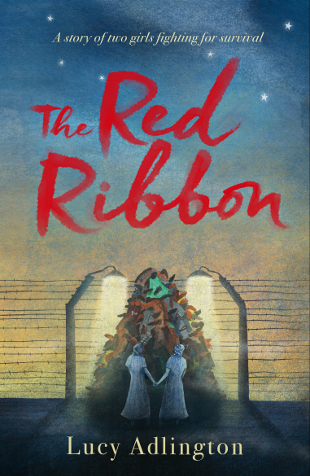 Inviting you into the wonderful world of fashion, fabrics, hats and home-sewing in the 1940s: the history behind Lucy Adlington's Carneigie-nominated novel The Red Ribbon, an amazing story inspired by the dressmakers of Auschwitz. Northern writers have found fame worldwide for their bold stories, unique humour and brilliant writing. A lively literary show featuring many favourite writers, poets and dramatists. Mother, Millworker, Milliner and Emigrant... Four very Victorian working women. Join us to discover the stories of their lives told through clothes. 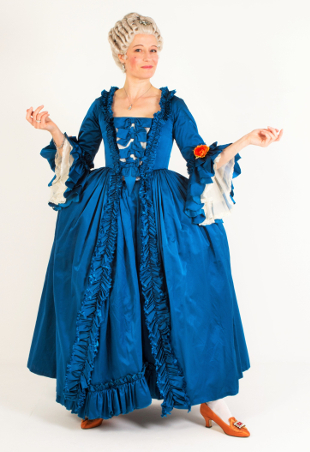 A unique costume history presentation with fabulous original crinoline gowns and accessories.